There is a lot that needs to be done to a frame before it goes up to be gilded. For us at A Street Frames, that means milling the frame, cutting it and then joining it. 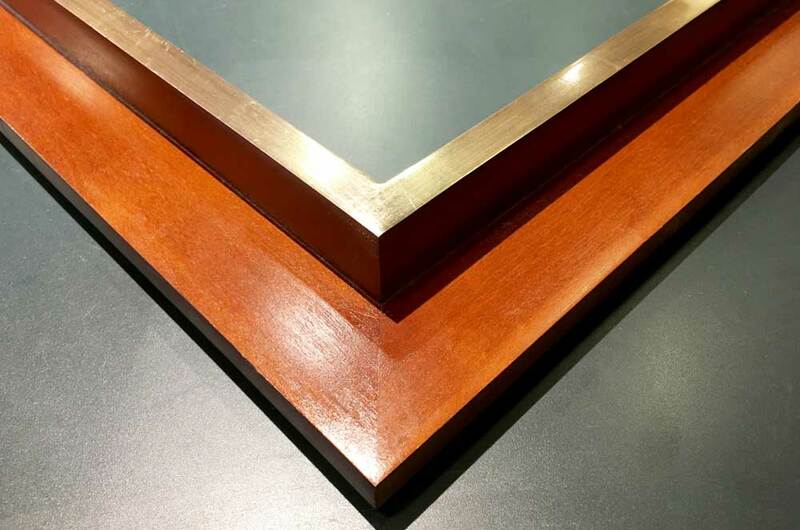 After that, the frame goes through a special process we’ve developed over the years that prepares it for our gilder and adds lasting value to the frame for years to come. Hairline cracks can be a common occurrence in the corners of gilded frames, but it does not mean the mitre or the frame itself is compromised. What a hairline crack in the gilding does mean, however, is that the wood has moved or shifted in the join, and since the gesso underneath the gilding is inherently brittle, the movement of the wood causes the gesso, and thus the gold leaf, to crack. 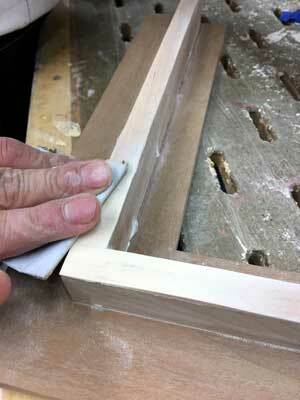 Gilders have many different techniques to minimize this and to attempt to eliminate unsightly cracks in the corners of their frames. 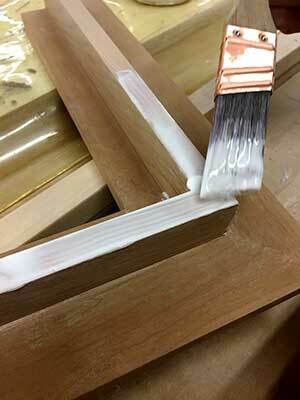 These techniques include covering the corners of the frame to be gilded with rice paper or thin silk, which is then gessoed over before gilding. We’ve found little to no success with these techniques, but instead have our own little trick that helps to keep a smooth line of gold throughout the face of the frame. 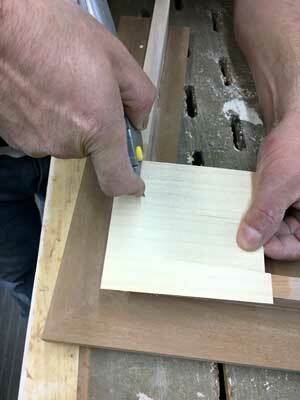 The 1st step in this multi-part process is to brush a thin layer of a specialty tight bond glue and then place a small square of maple veneer to the corner of the frame. Blue painters tape holds the veneer in place and also acts as a buffer to keep the glue from seeping onto the rest of the frame’s face. 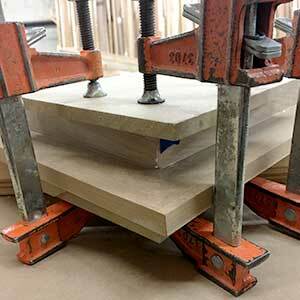 The maple veneer is clamped down with two MDF blocks on the frame at top and bottom of each corner; the glue is allowed to dry while clamped so that we can get the tightest bond possible between the veneer and frame corner. The blocks are removed after a suitable amount of drying time has passed (we like to let it cure for at least 24 hrs). getting as close as possible to the edge of the frame. It takes a slow and steady hand to make sure no damage comes to the rest of the frame. From there, each corner under goes a sanding process. 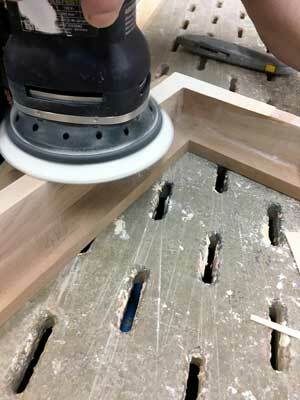 Utilizing a mechanical sander to smooth away the hard edges of the veneer. 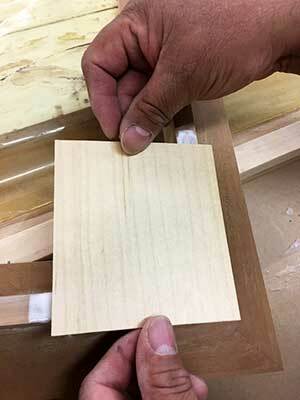 And then by hand using 220 grit sandpaper to help feather in the edges where the veneer meets the face of the frame. 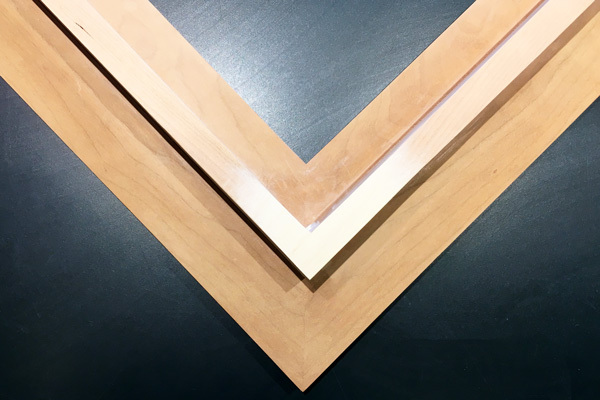 This process is repeated, alternating between both to make sure we don’t sand too much away and to make sure the veneer matches with the edges of the frame’s face and sides. Here you can see the finished result: a tightly secured maple veneer corner that covers the mitre underneath and adds strength to the now ready-to-gild frame. The frame will go next to our resident gilder who will begin his process of gilding, beginning with the gesso-ing of the frame and beyond to the finished product.